Located at the distance of about 40 kilometers, there is the magnificent fortified ancient city of Fatehpur Sikri. It is a UNESCO World Heritage Site within Agra District. Founded in 1569 by the Mughal Emperor Akbar, this ancient town was the short-lived capital of the Mughal Empire between 1571 and 1585. Emperor Akbar built this city as his capital to honour the Sufi saint Salim Chishti but unfortunately very soon he abandoned this city due to scarcity of drinking water. This is why it is also known as the Abandoned City of Mughals. Today, Fatehpur Sikri is considered to be one of the best preserved examples of Mughal Architectures in India. There are several historical monuments and ruins of ancient palaces and buildings within the walled city of Fatehpur Sikri which will remind you Mughal era and its beautiful architecture. Constructed in locally quarried red sandstone, the abandoned Fatehpur Sikri or the palace-city complex, is accessed through 9 gates namely Agra Gate, Delhi Gate, Gwalior Gate, Tehra Gate, Chor Gate, Ajmeri Gate, Birbal Gate, Lal Gate, and Chandanpal Gate. The palace city complex houses Winter Palace and Summer Palace of Queen Jodha Bai. The Jodha Bai Palace is one of the key attractions which you will never forget to see on your Fatehpur Sikri visit. Buland Darwaza: The Buland Darwaza (the Gate of Magnificence), the 54 meter high entrance to Fatehpur Sikri complex, is one of the most important attractions in Fatehpur Sikri. This magnificent structure was built by Mughal Emperor Akbar in 1601 AD to commemorate his victory over Gujarat. The highest gateway in the world, The Buland Darwaza is the main entrance to the fortified city of Fatehpur Sikri. 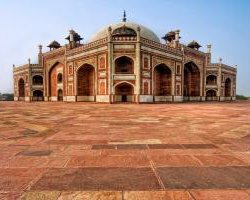 Built in red and buff sandstone and decorated by white and black marble, the Gateway is an excellent example of Mughal architecture displaying prosperous era of Akbar’s empire. Jodha Bai Palace: The palace city complex contains summer palace and winter palace for Queen Jodha Bai. Jama Masjid: The Jama Masjid in Fatehpur Sikri city complex is a key attraction for visitors here. Perhaps one of the first buildings constructed at Fatehpur Sikri, the mosque is beautifully decorated with while marble inlay work, in geometric patterns. Tomb of Salim Chisti: Within the Jama Masjid courtyard, there is the white marble encased tomb of the Sufi Saint, Salim Chisti. It is considered to be one of the finest examples of Mughal architectures in India. It was constructed during the years 1580 and 1581 by Emperor Akbar. Other Attractions: Diwan-i-Aam, Diwan-i-Khas, Ibadat Khana, Anup Talao, Naubat Khana, Panch Mahal, Birbal House, Hiran Minar, Hammam, Royal Workshop (Karkhana), and Hakim’s Quarters are some other attractions within the fortified city complex of Fatehpur Sikri.